My live butterfly garden was almost an accident – it was never intended to be a butterfly garden at all, it was simply a narrow strip beside the driveway where I built a rock retaining wall to grow my stock plants in. The plants that I grow in my Sedum and succulent nursery are - no surprise here - Sedum - perfect for the butterfly garden. 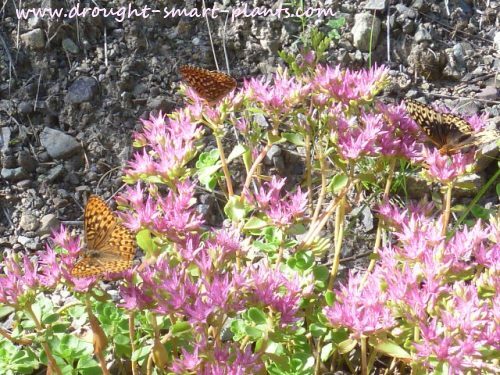 With over 40 different kinds of stonecrops, many low growing, some taller border types, all hardy to Zone 4 USDA zone map, which is Zone 5a on the Canadian Zone map, the butterflies have a lot of great choices. 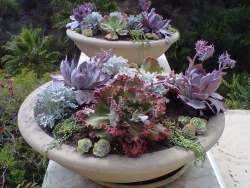 These hardy succulents love hot sun, dry well drained soil, and good snow cover in the winter, but no winter wet. If you live in a wet climate, good drainage is essential. Plants that attract butterflies generally are good plants for bees too – imagine my delight at the sheer numbers of wild bees, of many kinds, ranging from tiny blue green metallic ones to giant furry bumble bees. Sometimes on warm evenings, they camp out in the garden instead of taking their nectar back to the hive. Look carefully at this gorgeous creature - covered in pollen, butterflies are perfectly adapted as pollinators. Totally accidentally, their hair covered bodies will carry the pollen from one flower to another - making for a great harvest of seeds. In the morning, they’re sluggishly clinging to the undersides of the flower heads of Sedum spurium ‘John Creech’ and ‘Dragons Blood’, with its close relative ‘Fuldaglut’. They seem partial to the pink coloured blooms, but they are drawn too by the white flowered Sedum spurium album ‘Superbum’ which actually starts to bloom earlier. By the first week in August, it’s reaching its crescendo – over 200 bees at any one time, and more than 30 butterflies – Swallowtails, singly or in a pair, many Great Spangled Fritillaries and their imitators, the Zerene Fritillary, tiny Skippers, dark eyed Wood Satyrs, the occasional Pine White and many others. The whole butterfly garden is alive with activity; bees and butterflies intent on their own business, cheek by jowl with the other. I spend a few minutes several times a day checking on the flurry of motion, seeing which particular Sedum is attracting the most attention. Luckily, the blooms open in sequence, providing valuable butterfly food - nectar and pollen - over a long period for these sipping insects. Asclepias tuberosa, the milkweed. If you’re lucky enough to get a good crop, you’ll undoubtedly attract the Monarch butterfly, which lays its eggs on the milkweed and is the sole food for the growing caterpillars. Swallowtails are particularly fond of dill and Ruta graveolens, or rue. Their caterpillars depend on these plants entirely. Eupatorium purpureum, Joe Pye Weed is valuable too – for those gardens with moisture in the soil, this is one of the best butterfly attracting plants. With growth exceeding two meters, and flower heads of around 30cm (one foot across) this is not a plant to be messed with. If you’ve got the room, this is your butterfly plant. Echinacea, the purple coneflower, with its dark cone shaped central ray flowers, and Rudbeckia will also magnetically attract butterflies, as well as many other valuable beneficial insects. Other plants that are valuable for many butterflies are Achillea, the yarrow. Butterflies with a large wing span in particular value these as landing pads. 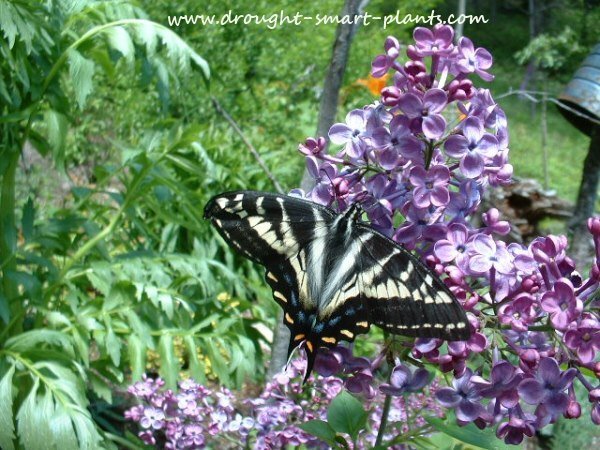 For early spring and summer, watch those lilacs - they'll attract swallowtail butterflies. Have several varieties for a longer bloom time. Willows are a valuable caterpillar host plant - in inadvertently, I cut down lots of what looked like dead willows; they grew up again from the roots and were an instant hit with those butterflies that will lay their eggs on Salix. 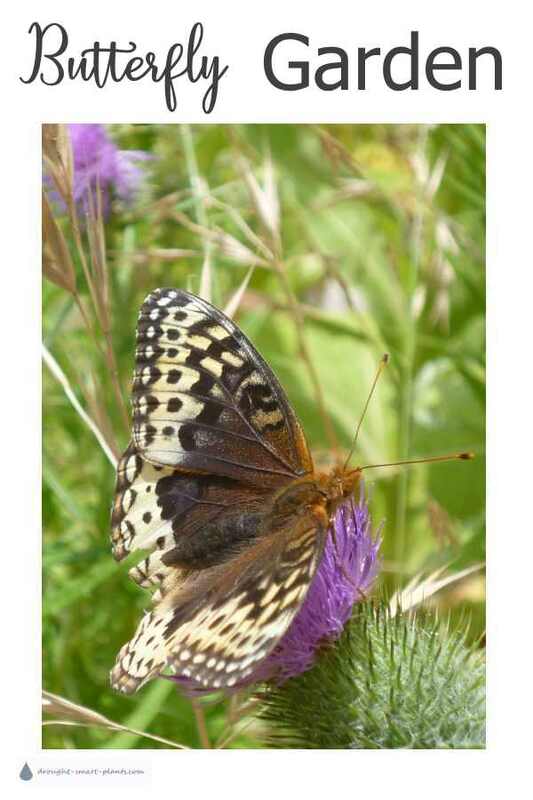 Planting some of these valuable butterfly attracting plants as butterfly food in your xeric garden is a no-brainer – they are beautiful plants in their own right, with the added benefit of attracting a butterfly exhibition to your very own live butterfly garden. Inviting caterpillars into your garden ensures that you have more generations of adult butterflies to give you pleasure and enjoyment. Wanting to identify your butterflies? See the Insect Encyclopedia. Gorgeous flowers attract equally beautiful insects; Lilacs are one of the favorite nectar sources of the Swallowtail butterfly.